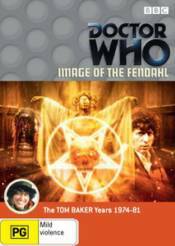 Tom Baker stars in this classic four-part story Doctor Who Image of The Fendahl.. In this nerve-racking adventure the Doctor encounters a legendary creature from his childhood fairytales � the Fendahl. An ancient human skull has been discovered by archaeologists and is being used by Professor Fendelman in his Time Scanner experiments on contemporary Earth at Fetch Priory. Drawn by the operation of the Scanner, the Doctor arrives as the experiments reach a peak to witness a series of strange happenings.